Looking through the lens: The last of summer 2010? The last of summer 2010? Sometimes we do get surprised by an Indian summer, late in September or early October here in Bergen. But when the rain and wind sets in come mid-August, most of us realize summer is at an end and autumn is close at hand. 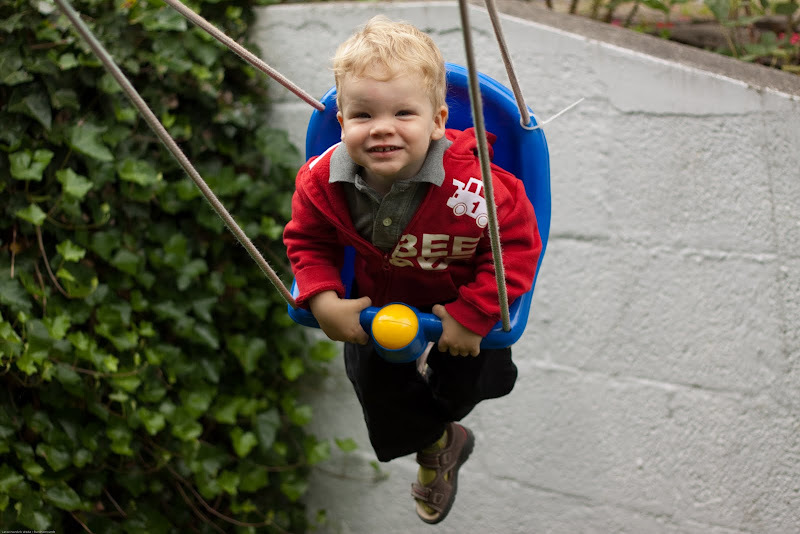 One of the evenings was spent out in the garden, playing with Sebastian on his much loved swing-set. I must say it is really hard to capture a shot of the kid on the swing. He want's his swing to go over the rooftop: "Over the roof dad, over the roof!" he shouts as I try not to overdo it. The boy is one speed/swing-junkie, and I can't wait to take him along to a real amusement park (Not unlike the one we went to this summer, but he needs to grow a few inches. So maybe in 2-3 years time, dad will take him on a real roller-coaster.